See below for a brief history of Louis Vuitton, the luxury handbag brand. Nicolas Ghesquièire succeeded Marc Jacobs as the new creative director of Louis Vuitton. Louis Vuitton uses a number of signature leather and canvas types in their handbag designs. See below for an overview of some of the most popular styles and how we recommend you look after them. Vachetta is commonly the name Louis Vuitton use to call the leather used on their handbags and luggage range. This typically is used on the brown top & bottom trim along with the handles. 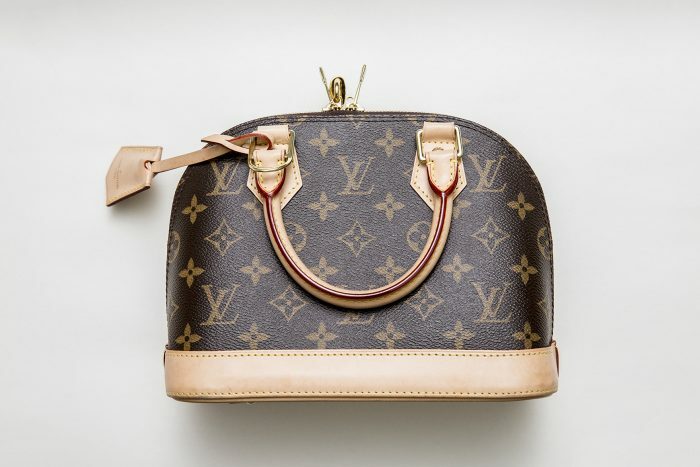 Dark Vachetta is a good indicator that a Louis Vuitton handbag is genuine and authentic, as plastic imitation Vachetta won’t go darker and undergo the Patina process. 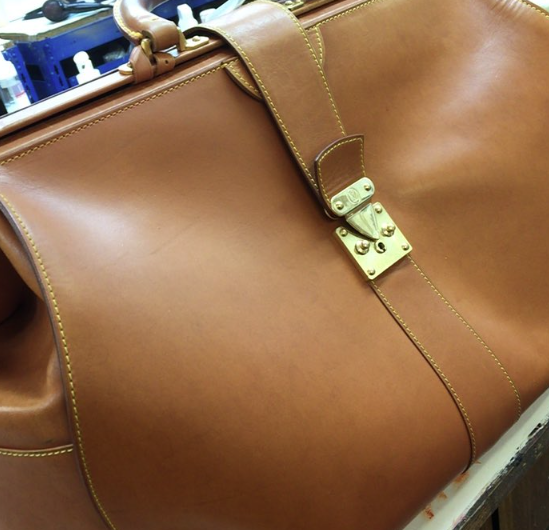 Dermo Protect protects finished & unfinished leathers (such as Vachetta) from day to day staining, liquids, dye transfer, ink and more. Dermo Protect ensures you can clean away any handbag disasters using specialist cleaning products, such as our Antibacterial Cleaning Wipes. A mild cleanser, hydrator & stain guard all in one product, Everyday 3 in 1 cleans and offers a light layer of protection all at the same time. Use this product weekly (depending on how regularly you use the bag) and ensure you protect your Vachetta leather after cleaning with Dermo Protect. To hydrate unfinished leather like Vachetta, you can use Pure Hydrate. It restores the natural softness to leather by replenishing the natural oils. This gives an intense hydration treatment for your vachetta for use when needed. To clean unfinished leathers, such as Vachetta, we recommend using Sensitive Cleanse. It allows you to clean off the buildup of dirt, by creating a thick solution that sits on the surface for longer than other products. Use every couple of months & remember to protect your leather after cleaning with Dermo Protect. Whatever you do, do not spot clean Vachetta – ensure you wipe all the Vachetta with a lint free cloth when applying any product. So what is Coated Canvas? This may come as a shock to some handbag enthusiasts, but simply put, it’s cotton canvas (or fabric) coated with PVC. 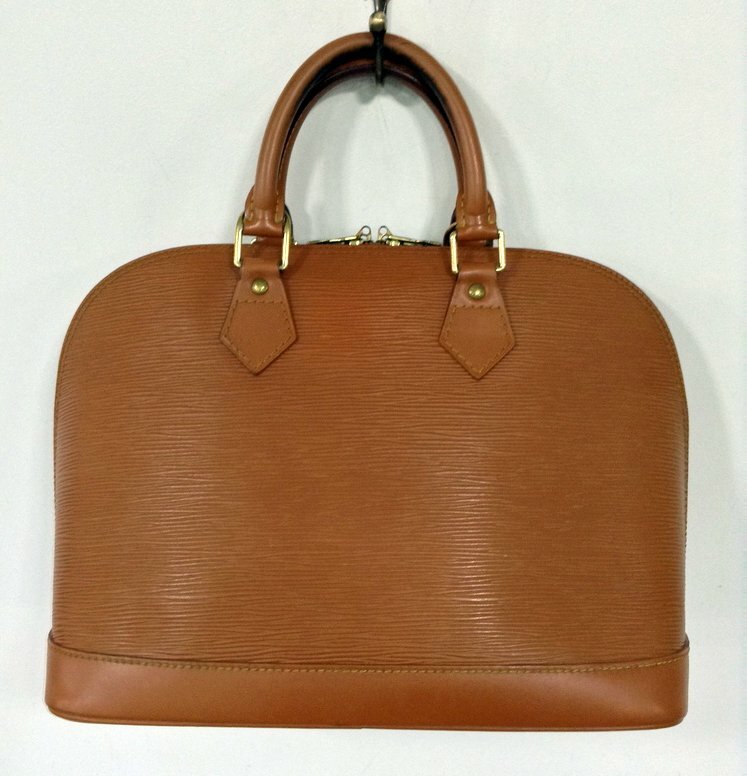 It can be surprising to discover that your Polyvinyl Chloride coated bag is not in fact leather, but it may still have some leather components, such as the handles or piping (like Louis Vuitton’s Vachetta trim). 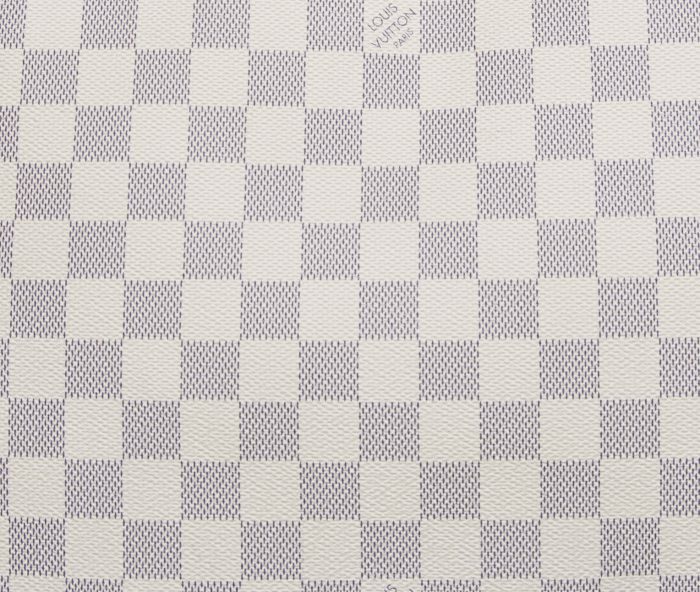 Coated Canvas is used by designer brands such as Louis Vuitton (typically on their Monogram and Damier lines), Dior, Fendi and Goyard. When looking at the history of Louis Vuitton, you will see that Coated Canvas has been a signature material used by the brand for its luggage and handbag ranges. Don’t despair if you purchased a Coated Canvas item believing it was leather, as Coated Canvas does have its own range of benefits. Handbags made from Coated Canvas are generally lightweight and durable, so you’ll have no back problems from carrying heavy bags! The application of a plastic coating to make coated canvas, ensures it’s scratch resistant. Another feature of this material includes, its waterproof nature, which makes it easy to clean with the correct specialist cleaning products. You can find out more on maintaining your coated canvas item below. 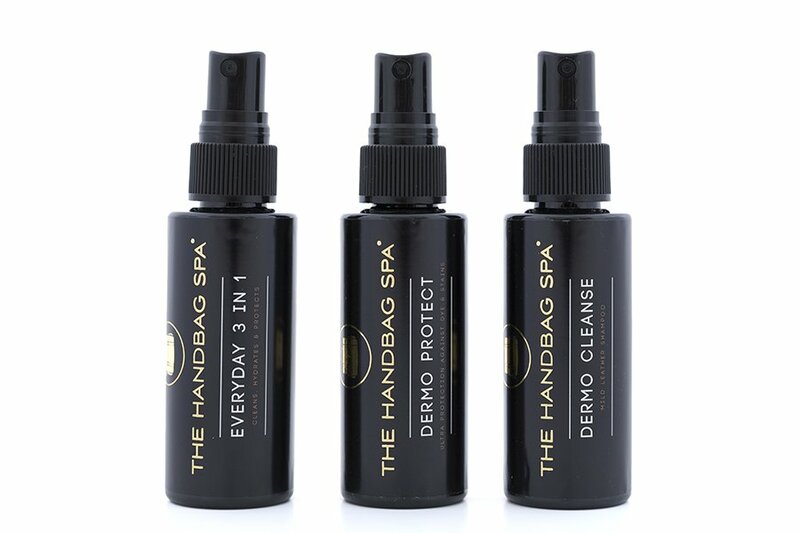 Dermo Cleanse is a gentle foaming product, strong enough to remove stubborn ground in dirt, yet mild enough to allow regular use on protected leathers. Use every couple of months. Does the idea of germs on your bag gross you out? Well we’ve developed an antibacterial cleanser – proven to kill 99% of common bacteria! 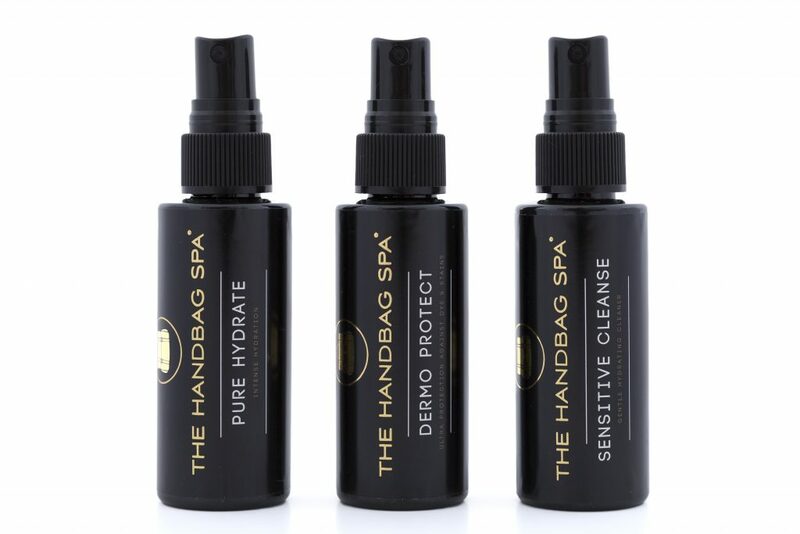 Anti-Bacterial Cleanse is the U.K’s only proven anti-bacterial killing product for this application, specifically designed for handbags. Not only that, but this product can be used on ALL types of fabric, canvas & leather. We recommend cleaning your Coated Canvas with Anti-Bacterial Cleanse weekly / monthly. So how do Louis Vuitton create Epi leather? The process of making epi leather is very specific, the natural leather is tanned with plant extracts and then deep-dyed. Afterwards, a special colouration on the surface of the grain is applied, which creates its distinctive coloured two tone effect. A key characteristic of Epi leather is its durability and ability to withstand any weather condition. So if you’re looking for the perfect companion for the rainy UK climate, choose a bag made from Epi Leather! Keen handbag connoisseurs will note that there are actually 2 types of Epi leather: Classic Epi leather and Electric Epi leather. Both Epi styles are resilient to water damage and are suitable for everyday use, but the key difference between Classic Epi leather and Electric Epi leather is their appearance. The matt, smooth appearance are common characteristics or Classic Epi leather. Whereas Electric Epi leather has a high-shine, patent-looking finish compared to its counterpart. This makes Electric Epi leather an enticing choice for those who want a wearable patent bag. Dermo Protect protects finished leathers (such as Epi) from day to day staining, liquids, dye transfer, ink and more. Dermo Protect ensures you can clean away these handbag disasters using specialist cleaning products (such as our Antibacterial Cleaning Wipes). A mild cleanser, hydrator & stain guard all in one product. Everyday 3 in 1 cleans and offers a light layer of protection all at the same time. Use this product weekly (depending on how regularly you use the bag) and ensure you protect your Epi leather after cleaning with Dermo Protect. Dermo Cleanse is a gentle foaming product. It’s strong enough to remove stubborn ground in dirt, yet mild enough to allow regular use on protected leathers. Use every couple of months. Remember to protect your leather after cleaning with Dermo Protect. If your Louis Vuitton handbag is looking a little worse for wear, send it into The Handbag Spa for our team to asses. Once here it can undergo treatments to clean and restore its appearance.